It is an extraordinary document, this record of early California. One of only two such documents in the history of that western state. And extraordinary in its own right. Yes, The Legal Genealogist is still poking around in California’s laws, getting ready for tomorrow’s spring seminar of the Root Cellar Sacramento Genealogical Society. And this one is a joy. Ultimately copied by hand onto parchment and ordered to be entered “among the archives of the State”, the 18-page document was the end result of California’s first Constitutional Convention, which met in Monterey from 1 September to 13 October, 1849. Most of the delegates to the Convention came from states east of the Mississippi, with the highest number (10) from New York. Of the 48 delegates, six were born in California. Nineteen had lived in the area for less than three years. And all 18 pages have been digitized and are online for your viewing and reading pleasure at the California State Archives website. A really neat document and one of many fascinating early California records available online and off at the California State Archives for genealogical research. 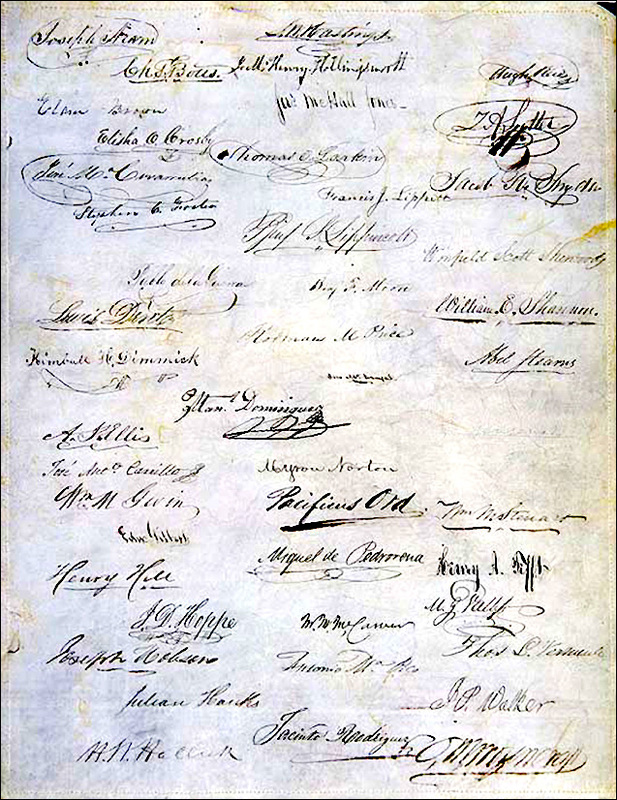 You should have noticed that the signature of one of the most important, if not the most important delegate to the Constitution is not on that page. It is the signature of Dr. Robert Semple, President of the Constitution and tireless promoter of statehood since 1846. Is there an explanation as to why he didn’t sign it?